The rain fell hard from the sky, a small fire the only source of warmth for the small company of Goblins huddled around it sleeping. Only Rhyker was awake, keeping watch for anyone foolish enough to stumble too close to their lair in the small cave. Another messenger crow lay dead at his feet, this one arriving only a short time ago. He unfolded the scrap of cloth he pulled from the dead crows mouth. It was another letter from Dhatta, as expected. Spot, Dhatta’s faithful Warg companion, woke at the smell of his masters smell drifting from the note. He let out a soft whimper before Rhyker kicked him to keep him quiet. He let out a low growl but put his head back down. They would have to act on their plan soon before the guards disposed of him. A Goblin prisoner held little value for them. The hastily scribbled note was written in the typical filthy scrawl typical of most Goblins, and whatever he used to write it with gave off a terrible odor, even for a Goblin. If the earlier letters to be believed, great riches awaited their paltry company if they could get over the Misty Mountains. Dhatta had been lurking in the attic of a local tavern listening to a loud drunken company of Dwarves discuss the news that a distant cousin had brought them. Treasures beyond count lay in the ancient, forgotten lands of Arnor. Where exactly the treasure lay, Dhatta had kept to himself, knowing full well the rest of the company would simply leave him behind. If the ragtag band of Goblin’s could get there first, they would become legends and warlords like no other. This was my 3rd time playing this map, 2nd time with this battle company, but first time doing it correctly! It was a great game with some awful rolling in the first quarter by my opponent Benoit, sending his town guard wandering around like fools. But 1 lucky soldier managed to hold up my entire advance and swing the game dramatically. This was a VERY close and lucky draw which could have easily gone either way! Your battle company has had 1 random member of your party thrown into the local jail. You must break him out and escape the map with at least 33% of your troops (including the prisoner). If everyone is knocked out of action, you lose. Any other result is a draw. The enemy team in this mission is a group of basic humans with bows, spears, and swords. This represents the town guard. Until the alarm is sounded every guard must roll a dice at the start of the turn to see what they do. On a 1 they don’t move, 2-3 the opposing player moves them up to 3″, 4-5 the controlling player moves them up to 3″, 6 the controlling player moves them their full movement. The alarm is sounded if an unengaged guard is within 3″ at the end of a turn, or is shot by a bow and not slain. 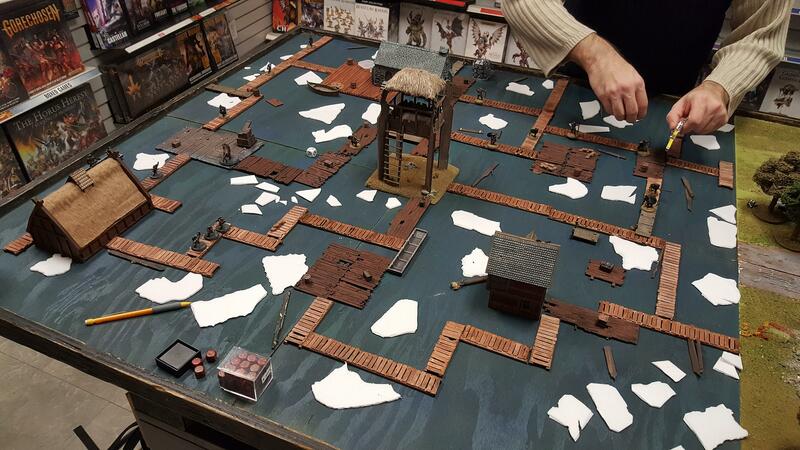 The map is all docks over a lake with moving ice flows (rolling a directional die and D3 for distance in inches). You can jump on the ice if you wish but may find yourself floating away! 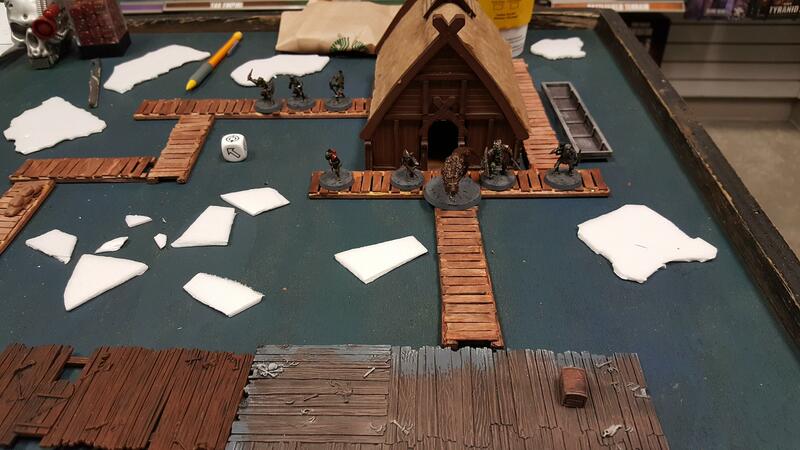 On a freezing night where you would want nothing more than to be at home by a warm hearth, a small band of ragged Goblins and a large Warg crept into the silence of Laketown. The guards were out in force ever since Dhatta was captured a couple of nights prior, keeping watch for any more of their slinking kind. If they found one, more would likely be nearby. The Goblins had snuck in from the North Eastern side of town and had hoped to get into the jail quickly and quietly without alerting the guards. 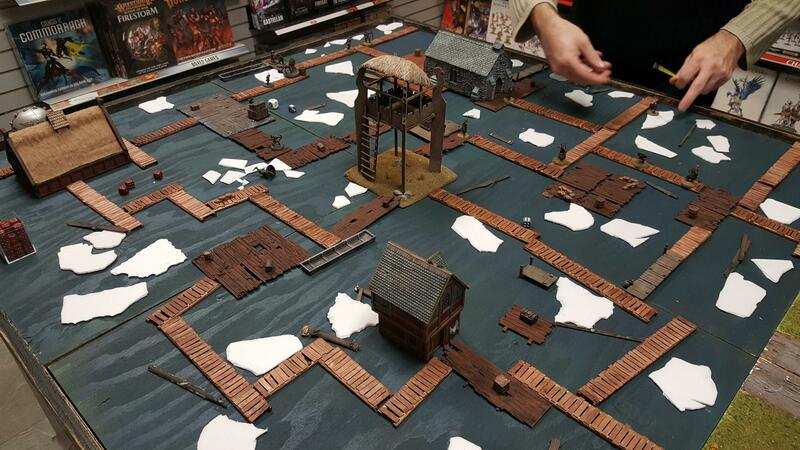 They would not be able to take on a full town in their condition, even if they were just pitiful men. Something seemed to keep the guards attention on the South West side of the city luckily and left only a few guards in their way to silence…. Spot, who had been prowling forward without making a sound at the head of the Goblin company, stopped for a moment before he then leapt through the air to crash into the guard from behind. 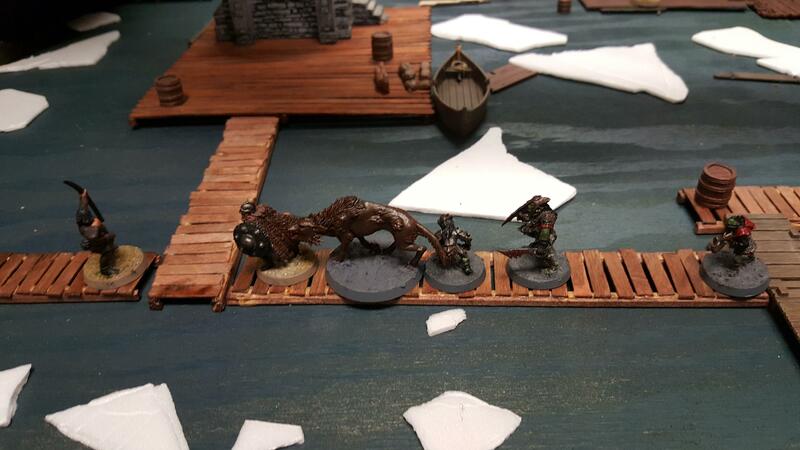 Gheordhi was right behind the warg ready to provide support and ensure the guard died a quick and quiet death. But it was not to be. Gheordhi’s less than subtle attempt at sneaking in behind Spot had made more noise than he intended and the guard turned at the last moment and was able to raise his shield in time to cover himself from the warg attack. He immediately yelled out in shock, alerting the nearby archer and then sending the cry through the town that intruders were upon them. Spot struck again and again, lashing out with teeth and claws, but the guard could not be beaten. Step by step he was driven back, every blow he struck aside giving the rest of the town guard time to come to his aide. Far too late did Spot finally manage to sink his teeth into the guards neck and silence him for good. 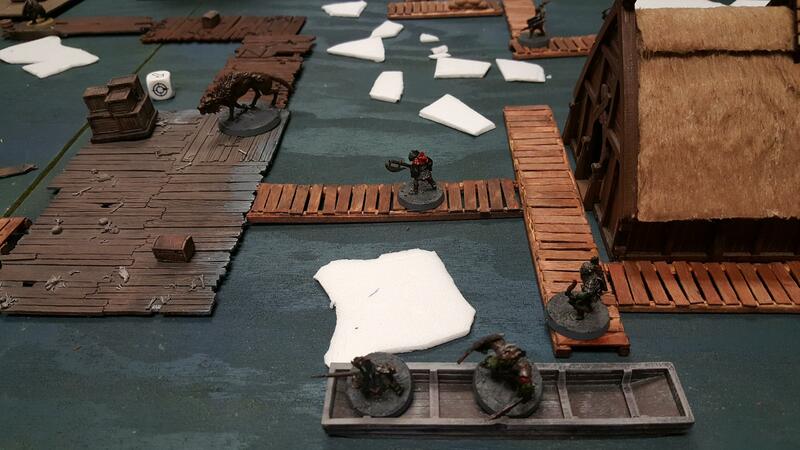 The pounding footsteps and yells of guards filled the air now as the Goblin team tried to quickly get to the jail. Spot continued his charge after tossing the guards body aside and went straight for the archer who was in full flight towards the nearby docked boat. But to the archer’s surprise Rhyker jumped from the docked boat, swinging his large axe straight into the shocked guard before he could even react, felling him instantly. 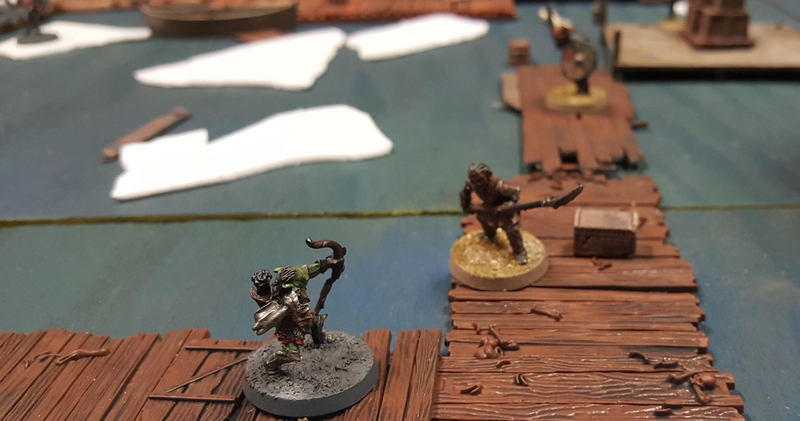 Before the body even hit the ground arrows were flying from across the docks into the Goblin’s who were now standing in the open without cover. 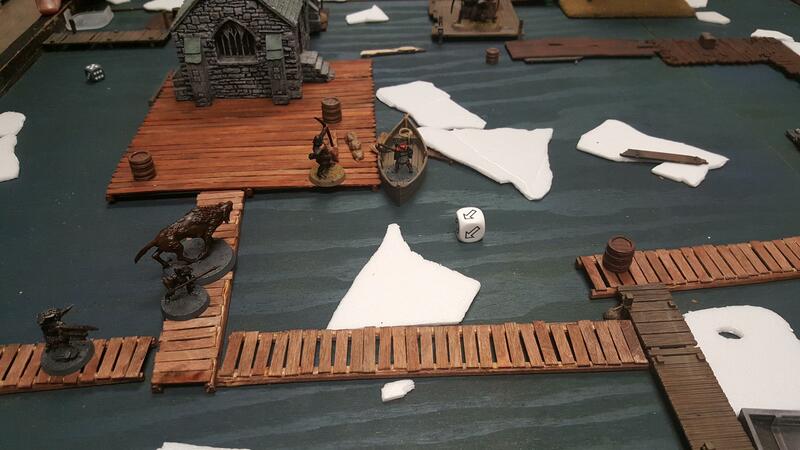 An arrow flew into Spot, knocking him off the docks into the water with a loud yelp, which carried him away into the night..
Rhyker quickly smashed the jail door down, being a Prowler with a 2 handed axe against a “trapped” door gave me a pretty stacked dice roll to break it thankfully! As the rescue team now looked to make their escape, unfortunately the town guard had caught up and now blocked the only path out. I would have to fight my way through multiple guards in order to escape while also being shot in the back by arrows. With a powerful swing of his axe, Rhyker smashed the prison door to pieces in one blow. He cut the ropes binding Dhatta to the floor and told him to get out as fast as he could. Rhyker went back out the way he came to continue the fight while Dhatta ran out the back door. A lone archer was standing near the back door and heard the crash as it flew open and the prisoner tried to escape. He dove after him and the two of them punched and clawed at each other, trying to bring a quick end to the fight. 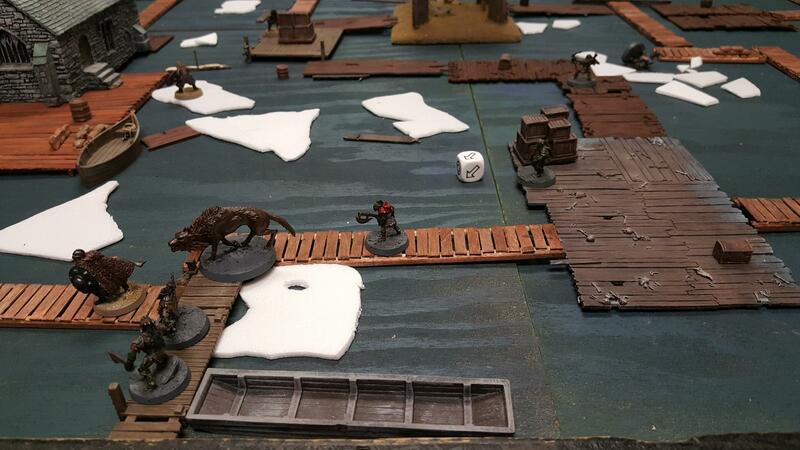 Dhatta finally managed land a blow into the guards head, knocking him unconscious as his body slumped to the deck and rolled into the icy waters below. Dhatta quickly ran South as fast as he could and melted into the shadows to escape. 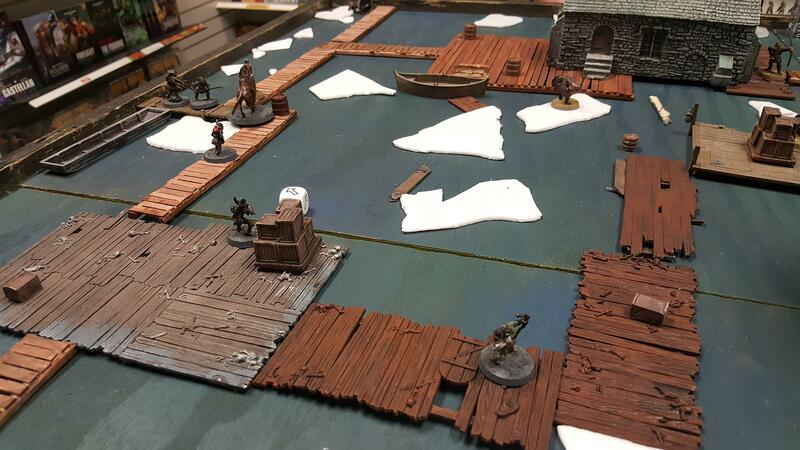 The rest of the party was suddenly pinned in, guards blocking their only escape. Pikhard and Gheordi threw themselves into the enemy while Rhyker waited for an opening, hiding from the flying arrows. Luck however was not on their side and the guards held their positions fiercely until Gheordhi was stuck in the back by an arrow and Pikhard was finally knocked down and kicked into the water. 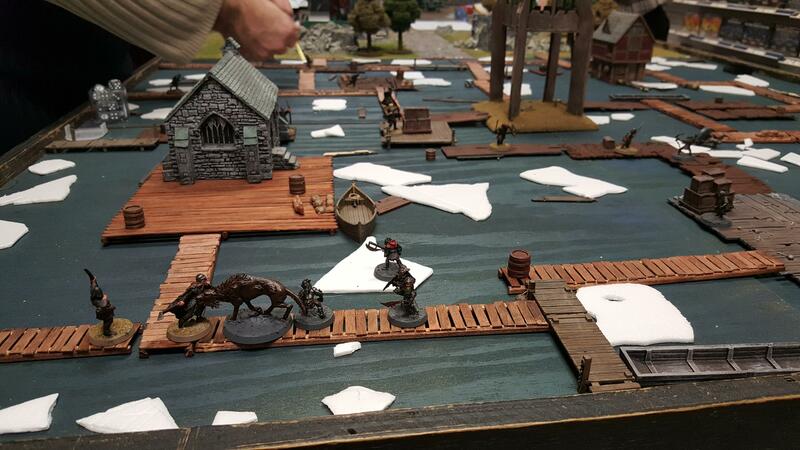 Rhyker, seeing no chance at escape, dove into the water himself and began swimming South…. The game ended in a draw with the prisoner (Dhatta) escaping but without the 33% of my troops leaving the board needed for a win! This game was nuts in how a series of turns would go terribly for us both back and forth causing all kinds of situations neither of us expected. Very fun and the best game on this map I have had yet for sure. None of my troops gained enough experience to level up, in fact I only caused 2 wounds the entire round! I had to roll on the injury chart for everyone except Dhatta and Rhyker, and somehow they all escaped any injury at all. Except for Spot! He was wounded enough that he would have to miss the next game, something that would end up costing me dearly! I hope this wasn’t too long…it probably was. But very fun to do! 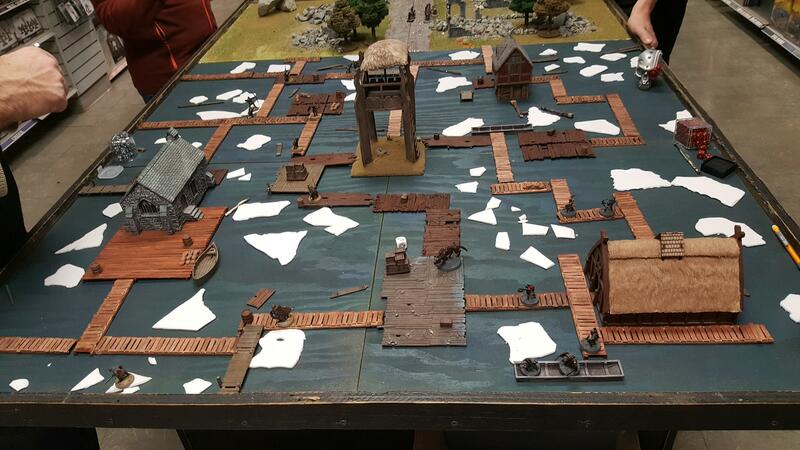 Stay tuned next time for Game 2 in this Battle Companies campaign!